A. TWO SOFA DESIGNS FROM HEPPLEWHITE'S "GUIDE"
B. SOFA DESIGN FROM SHERATON'S "DRAWING-BOOK"
TWO DESIGNS FOR SIDEBOARDS BY SHEARER From "The Cabinet Maker's London Book of Prices," 17S8 More alternative contours for the sides in rhe upper plate and the four decorative treatments of legs carried it into the Empire Style as in Plate 123. The firSt of these displays in its back-design the American eagle, so frequently appearing in our furniture from now onward. This sofa—a rather recent acquisition of the Metropolitan Museum—is believed to be the work of the same man as the Hepplewhite sofa previously mentioned; the characteristics of clean, sharp carving and Stippled background prevailing in both. 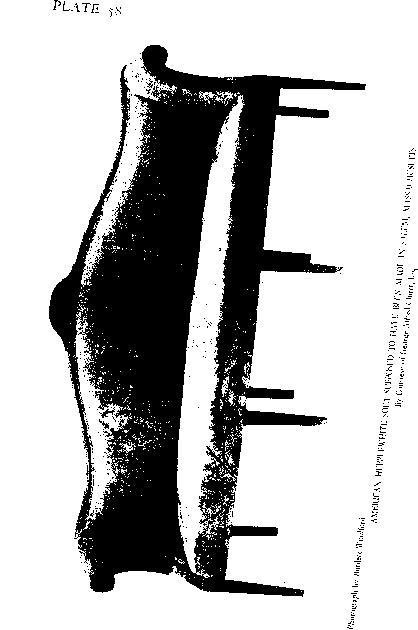 The frieze of the back in this Sheraton sofa is the alternate fluting and rosette motif extensively used by Samuel Mclntire, the Salem architect, in his following of the Adam Style, of which he was a leading exponent. 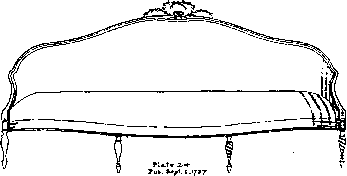 It is a common "property" of that Style—see the lower moulding of the entablature of the Adam mantel in Plate 133. The Hepplewhite firm in England freely employed it as the frieze of numbers of their cabinet-pieces, moSt of which till quite late in their career were thoroughly Adam-esque in detail. Duncan Phyfe of New York in his earlier manner was one of the principal exponents of the Sheraton Style. We shall see more of his work in the Direttoire chapter, but the sofa in Plate 59 is a very fine example. The three-panelled back-rail was one of Phyfe's original and favourite treatments and extended into his Direftoire derivations. The carved ornaments of this rail will be treated in connexion with these. "Phyfe sometimes turned the outer ends of the arms of Sheraton sofas inward. is entirely upholstered, no wood showing above the base save the arms. Rounded backs occur and they are treated in the same manner. Caning was also used in this period. 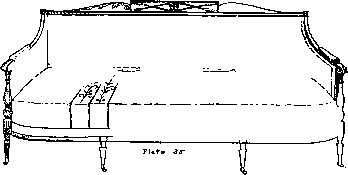 The case of sideboards is very different from that of seating-furniture—even the attributions of well-known writers sometimes vary, and it will soon be seen that they may easily do so. 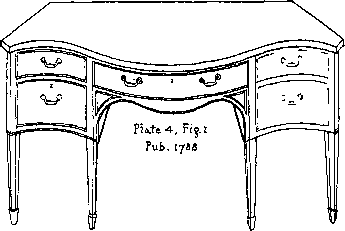 The naming of furniture Styles after individuals, which began with Chippendale, has not proved an unmixed blessing. 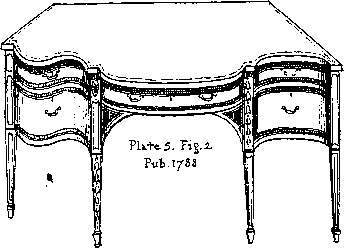 The overlapping of the schools of Hepplewhite and Sheraton, particularly in America, where our craftsmen sometimes combined the contours or motifs of two or more designers, makes it practically impossible to assign some furniture with certainty; and it is for that reason that here they are considered together. There is much in favour of calling it all Neo-Classic and being done with complications, and yet our sense of fairness bids us give honour where honour is due. Furthermore, it is almoSt impossible to change an existing cuStom. The sensible course seems to be to give credit when we can, and follow the alternative when we muSt. 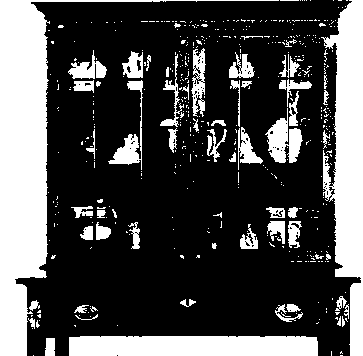 By the law of compensation, a very happy result of these complications is that in attempting to learn to differentiate the Styles one gathers far more information about the furniture of this whole period than he would be likely to accumulate in any other way: for real observation and comparison are the two essentials in the Study of any furniture. It will be as entertaining to the reader as a crossword puzzle to take up this matter as if, of his own accord, he were trying to elucidate these differences as regards our American pieces. He may possibly hear this "easy rule." 1. 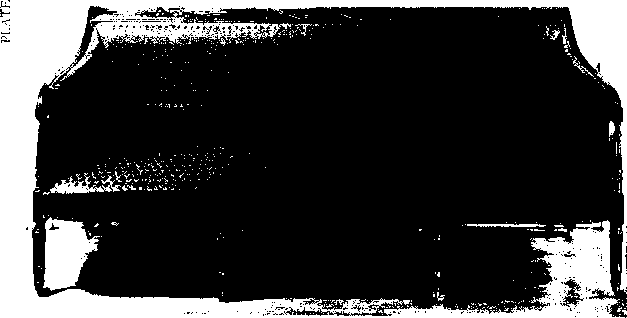 "The square, tapered leg, especially with the spade foot, is Hepplewhite."